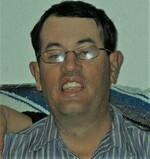 John Curtis Mills, 51, of Las Cruces died Monday, March 4, 2019. Curt attended local schools and graduated from Las Cruces High School and Dona Ana Community College. He was self-employed. During his school years, Curt was a member of the H-C 4H Club. He enjoyed camping, hunting, and going on trail rides. He will be missed by all who knew and loved him. He is survived by his parents Kenneth and Donna Mills of Las Cruces; sister Sherry Sanderson of Fort Collins, CO; nephew Jared Mills of Las Cruces, and niece Samantha Kretz (Lyle) of Tijeras, NM. His brother Clinton Mills preceded in death as did his grandparents, J.C. and Robbie Mills and Jack and Mary Trellue. To send flowers to the family of John C Mills, please visit our Heartfelt Sympathies Store.